I'm pleased to welcome back SaneBox as this week's sponsor. I've been using Sanebox for years and it still saves my bacon every day. There are so many great benefits to Sanebox. First and foremost is filtering. Sanebox looks at all of my incoming email and filters it for me to appropriate mailboxes. That way, the first thing in the morning I see are only those emails that are most important. However, Sanebox can do so much more. I used to make fun of email deferment until I started using it with Sanebox. Now I use it all the time. When an email comes in that I don’t need to deal with for a couple days, rather than giving myself the extra work of scheduling a response in OmniFocus, I just defer the email two days. It disappears and then shows up again in my inbox in two days and I can deal with it then. Sanebox is highly customizable so you can set defer periods in hours, days, and weeks. Because Sanebox is a cloud based service, it works in the email client of your choice, including Apple Mail. 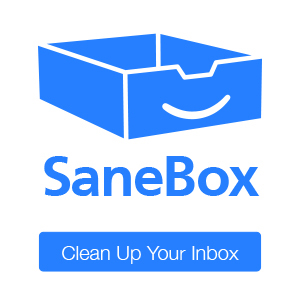 There is also an ingenious reminder system where you can blind copy an email to 1week@sanebox.com and the service will remind you if you don't get a response to the email within one week. There is a lot more to SaneBox. If you get a lot of email, the service can really help. You can learn more at SaneBox.com. Note the links in this post will get you a discount when you subscribe.